The Green Passion is one of several cycles drawn by Durer between the end of the 15th century and the beginning of 16th century. 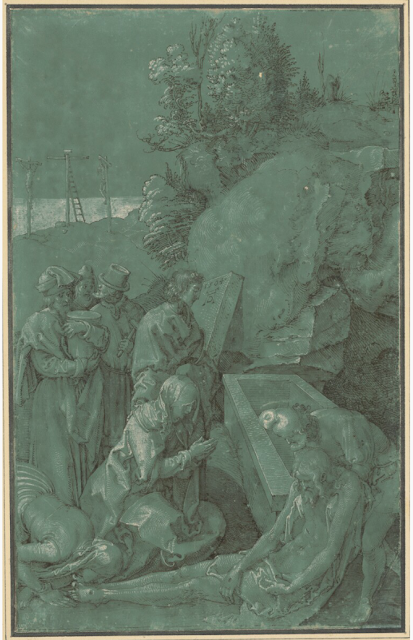 Of all the cycles by Durer, the Green Passion is possibly the most attractive and the most evocative – an art piece created for personal veneration rather than for a public art project. Very likely, the series were drawn by Durer for himself, because no records exist that mention reliefs or paintings that follow the same emotional intensity or compositional solutions. Overall, the series is significant on account of its unusual green background, dramatic highlights, and compelling mood. 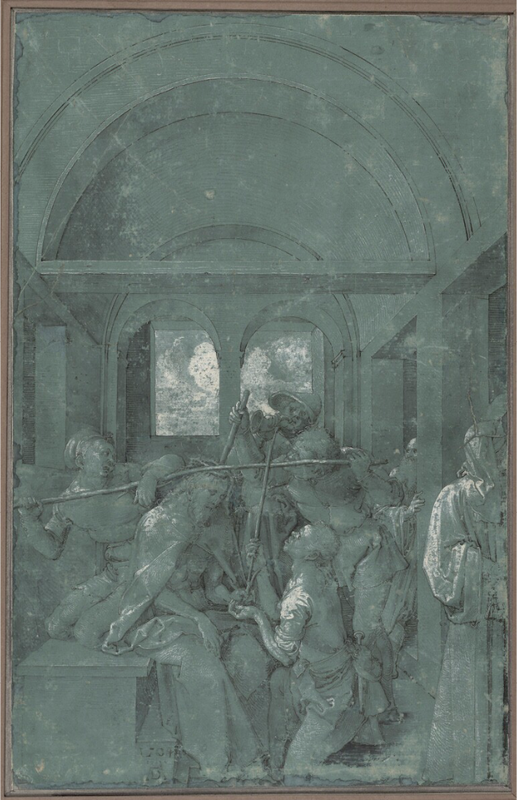 Passion Cycles differ from the Via Crucis in that they were usually meant for private use and were often bound into prayer folios or books comprised primarily of illustrations, in which text was sparse. Also, Passion Cycles often included images of scenes that were specifically curated for individual needs of the folio owners. Scene selection could extend beyond the Passion Narratives. For example, a series might include Expulsion of Adam and Eve from Paradise or Christ’s Descent into Hell. Some cycles had as many as forty plates that could provide material for visual meditation. 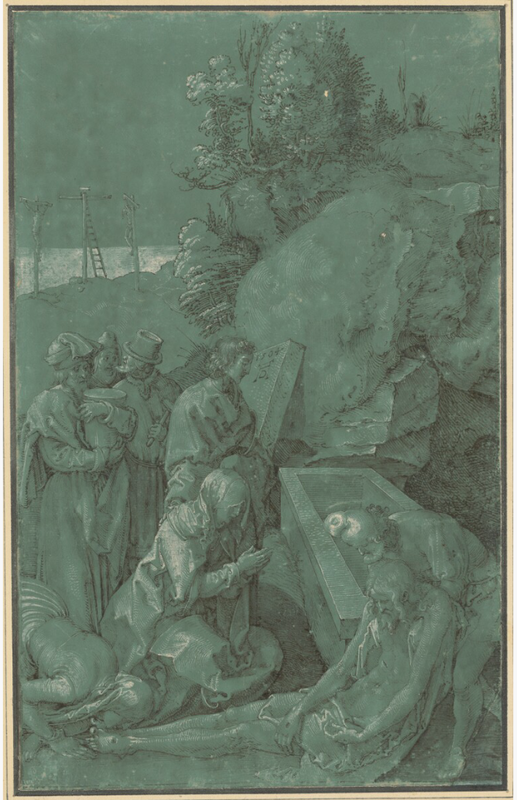 The Green Passion of 1504 is a gripping set of eleven chiaroscuro drawings, each about 28 centimetres long by 18 centimetres wide. Unlike Durer’s strongly linear drafting works, this series exploits volume and color delegating the line to an almost subordinate role. I write - almost subordinate - because close look at the leaves reveals that the linear structure is quite dominant and only skillfully deemphasized to allow for a more penetrating mood. 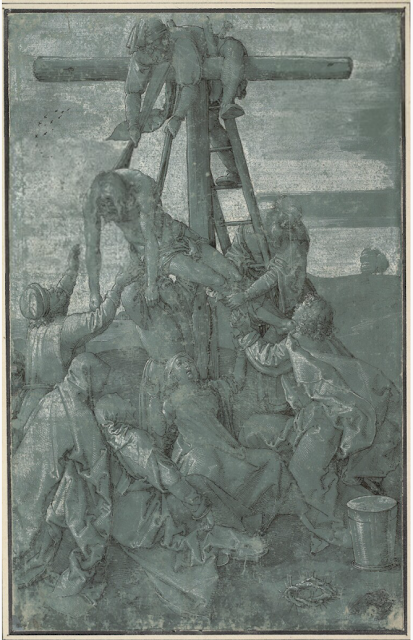 The composition and figures are characteristic of Northern style, individualized and perfected by Durer with some clear connections to the art of the Italian masters. The realism of the Green Passion is powerful and expressive but stylized and controlled by the artist. The tension between structured architectural elements in some of the plates, delicate landscape in others and an always densely populated middle ground is wonderfully amplified by the green hue of paper. The uncommon choice of green for a background color lends a memorable ambiance to every image. White highlights also help to imbue every plate with plasticity and drama where gestures are vivid and aura is majestic despite a relatively small size of the images. Ludolph of Saxony, a Carthusian monk and writer, describes six ways of looking at the plates contained in a Passion Cycles. A devout viewer should aspire to look by way of imitation, of compassion, of admiration, of exultation, and of resting in it (contemplation) – all while dwelling on God’s loving condescension. 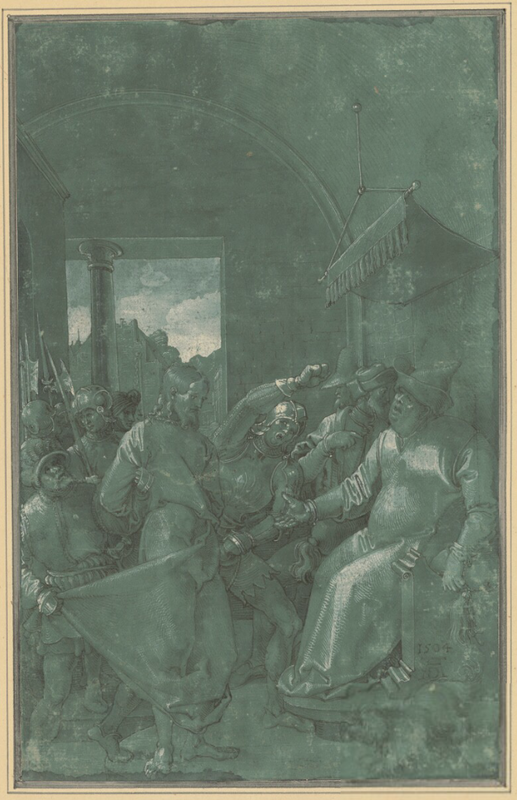 The Green Passion is part of the permanent collection of The Albertina Museum in Vienna.